PASADENA, Calif. - The lunar twins of NASA's Gravity Recovery and Interior Laboratory (GRAIL) mission have each completed a rocket burn that has sealed their fate. The burns modified the orbit of the formation-flying spacecraft. Over the next three days, this new orbit will carry the twins lower and lower over the moon's surface. On Monday afternoon, Dec. 17, at about 2:28 p.m. PST (5:28 p.m. EST), their moon-skimming will conclude when a portion of the lunar surface - an unnamed mountain near the natural satellite's north pole - rises higher than their orbital altitude. The maneuvers began at 7:07 a.m. PST (10:07 a.m. EST) today when the Ebb spacecraft fired its main engines for 55.8 seconds, changing its orbital velocity by 10.3 mph (4.6 meters per second). Sixteen seconds later, still at 7:07 a.m. PST, the Flow spacecraft began its maneuver, executing a burn 55.4 seconds in duration with a resulting change in orbital velocity of 10.3 mph (4.6 meters per second). 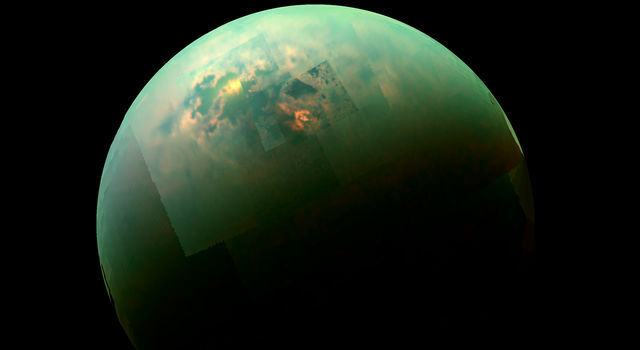 The spacecraft were named Ebb and Flow by elementary school students in Bozeman, Mont., who won a nationwide contest. Ebb and Flow are being sent purposely into the lunar surface because their low orbit and low fuel levels preclude further scientific operations. "NASA wanted to rule out any possibility of our twins hitting the surface anywhere near any of the historic lunar exploration sites like the Apollo landing sites or where the Russian Luna probes touched down," said David Lehman, GRAIL project manager at NASA's Jet Propulsion Laboratory in Pasadena, Calif. "Our navigators calculated the odds before this maneuver as about seven in a million. Now, after these two successful rocket firings, there is zero chance." 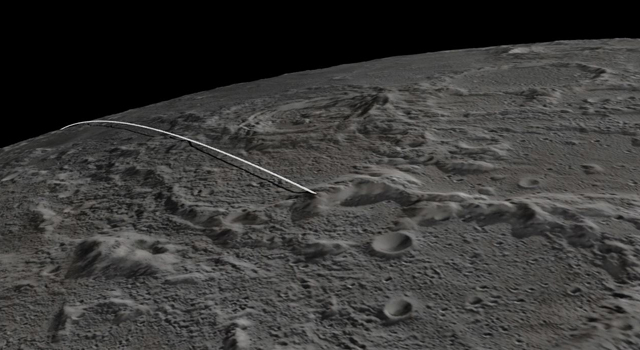 The unnamed mountain where the two spacecraft will make contact is on the moon's nearside, near its north pole, in the vicinity of a crater named Goldschmidt. Both spacecraft will hit the surface at 3,760 mph (1.7 kilometers per second). No imagery of the impact is expected, because the region will be in shadow at the time. 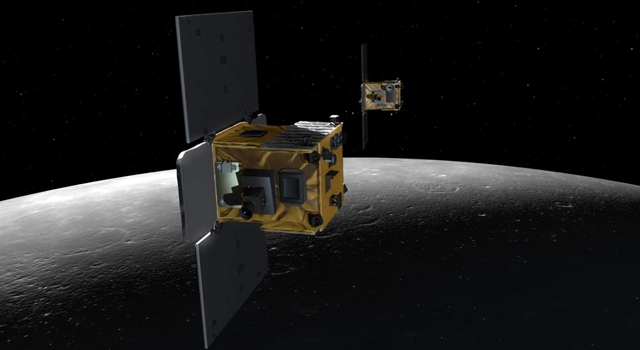 Both spacecraft have been orbiting the moon since Jan. 1, 2012. The duo's successful primary mission yielded the highest-resolution gravity field map of any celestial body. Future gravity field models developed from data collected during the extended mission will be of even higher resolution. The map will provide a better understanding of how the moon, Earth and other rocky planets in the solar system formed and evolved. 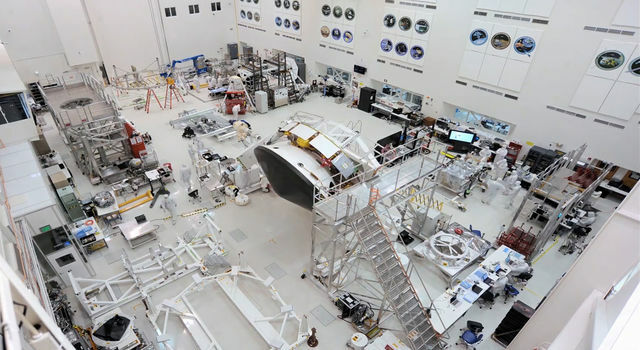 JPL manages the GRAIL mission for NASA's Science Mission Directorate in Washington. The mission is part of the Discovery Program managed at NASA's Marshall Space Flight Center in Huntsville, Ala. Lockheed Martin Space Systems in Denver built the spacecraft.